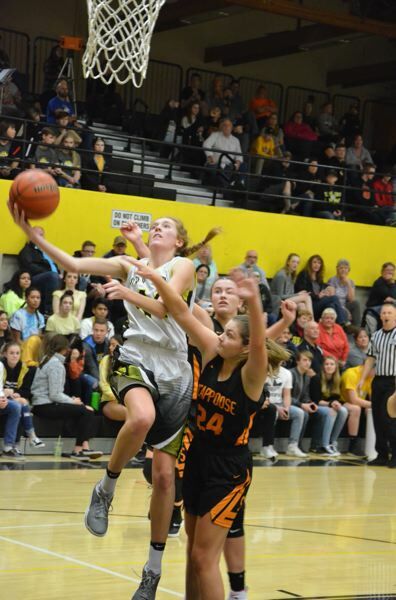 St. Helens led all the way against visiting Scappoose to win 45-36 in girls basketball on Jan. 11. The Lions snapped a three-game losing streak and took a 1-0 edge in the two-game season series with the Indians. Both those were big things for the Lions, because they were coming off an 85-48 loss to Class 5A No. 1-ranked Wilsonville and needed a victory to launch what they hope is a run to the state playoffs. "We were all pretty excited going into the game — it's the 'Seven-Mile War,' a friendly rivalry and always a fun game," said St. Helens junior point-forward Maddie Holm, who led all scorers with 27 points. "It was also our first league win, so I'm pretty happy." Holm scored seven points in the first quarter, nine in the second, five in the third and six in the fourth. Sophomore point guard Emelia Paullus added 10 points for the Lions. For Scappoose, Gaby Dague scored eight points, while Sierra Stafford and Allison Wills each had seven, Alivia Wills scored six and Emily Kopra added four. St. Helens scored the first six points and held the Indians without a point until they made a free throw with 1:14 left in the first quarter. The Lions were on top 8-3 after one quarter and 24-12 at the half. The lead grew to 39-19 with three minutes left in the third quarter. Then the Indians caught fire, ramping up their intensity at both ends of the court. "It all started on defense. We were getting some really great stops with our half-court trap, and we were all moving as a unit of five, defensively," said Scappoose's first-year head coach, Sarah Mann. "We made a little run, and it was fun. We tried to close the gap. We just ran out of minutes." Scappoose hit a free throw with 2:30 remaining to get within 45-36. The Indians then had three turnovers and a missed shot on the four final possessions. "It felt great to play that way in the second half," Kopra said. "We just need to get better at playing four quarters." The Lions came away with the same feeling. "We played well until the end. That was a little suspect. We dropped our intensity level," first-year St. Helens coach Michael Fendall said. "They made a run, and made it closer than it needed to be, but credit to them. They made shots, and we made some careless passes. "We're still learning how to finish out games. We have to learn that if teams aren't going to come out at us (to foul down the stretch), we literally just stand there with the ball." One thing Fendall liked was the way his team played, for the most part, when using a recently implemented man-to-man defense. This was the first time Fendall's team started a game playing man instead of zone. The idea was to step up the defensive focus. "It worked really well when we were engaged," Fendall said. "Our communication on defense was key," Holm said. "Our defense was what really gave us a boost this game." The rivalry, crowd and hunger for a league win helped in that regard, too. "The girls were intense, just wanting to come back and get a victory," Fendall said of his Lions. "I was really happy that we played with a lot of energy. It was a great atmosphere — the most fans I've seen here yet." One thing Fendall said he'd like to see more of is the basketball going through the hoop when his team is on offense. "We get up plenty of shots," he said. "Hopefully they start dropping at some point. I don't know if it's a confidence thing or just a bad streak." Fendall inserted sophomore Maria Reardon into the starting backcourt for the Scappoose game, and that also seemed to give the Lions more fire on defense, especially. "She's been playing really well in practice. She brings a lot of intensity, and I just thought maybe we would get off to a good start with her," Fendall said. "She gets into the (opposing) point guard. And she hit her first three shots, so it worked." Reardon connected from 16 feet to open the second quarter and made back-to-back 3's in the third quarter. Scappoose had some things that worked in the game as well and kept it from being a blowout. "We had a ballgame at halftime, and then the girls came out without the offensive firepower I was hoping for, until we found it in the fourth quarter," Mann said. "Offensively, we weren't strong with the ball the first and the third quarters. But we did that much better the second and the fourth quarters." Mann said Holm's play came as no surprise. "She's an outstanding player. She's a play-maker. She is able to develop her opportunities," Mann said. "She met my expectations wonderfully. "Defensively we had some things in our game plan of how we were going to stop her more effectively, and we didn't consistently do that. But there were times when we did that well and she had some offensive fouls and turned the ball." The Indians were able to disrupt the St. Helens offense as Scappoose made its run. "They were uncomfortable," Mann said of the Lions. Scappoose's goal is to put both parts of the game — offense and defense — together on the same night, and for more than just parts of a game. "If we can put four quarters together offensively, getting those defensive stops, too," Mann said, "then I think we've got a different outcome."